Sample layout for BASICline system with 2 collectors. The system can be equipped with more collectors for space heating support. This May Wagner Solar Inc. successfully received OG-300 System certification from the Solar Rating and Certification Corporation (SRCC) for 5 new residential system packages with either 80 gal or 105 gal solar storage tanks. The ECO BASICline packages feature the EURO C20-AR collector family, which rank among the highest rated solar thermal flat plate collectors under OG-100. In Europe, the Wagner Solar hot water and space heating systems repeatedly received top ratings during the last 3 decades and came out first in tests conducted by the national consumer testing agency “Stiftung Warentest”, the eco consumer organization “Ökotest” and independent testing institutes in 8 consecutive years. With the best performing package featuring an excellent Solar Energy Factor (SEF) rating of 21.7 under OG-300, the ECO BASICline is a top-performing system also under stringent SRCC testing procedures. For comparison: the US dept. of energy considers an SEF between 1 and 3 as “typical” for solar thermal systems. Hence the best BASICline package outperforms even the upper ranks of typical competitors by a factor of 7! OG-300 System Certification is required by a number of U.S. state and federal incentive programs and will provide access to additional government funds towards the investment of a residential solar system. About Wagner Solar: Wagner & Co Solar Technology has a successful history of growth throughout Europe, with subsidiaries in Spain, France and Italy and more than 350 employees. Wagner Solar Inc., located in Boston, Massachusetts, provides highly efficient solar thermal systems tailored to the US market for domestic hot water and space heating applications. As one of the largest photovoltaic integrators in Germany, Wagner Solar Inc. is also offering highly innovative and economic racking and mounting solutions for PV systems and will provide engineering support for installations in North America. Bilddownload 1: Sample layout for BASICline system with 2 collectors. 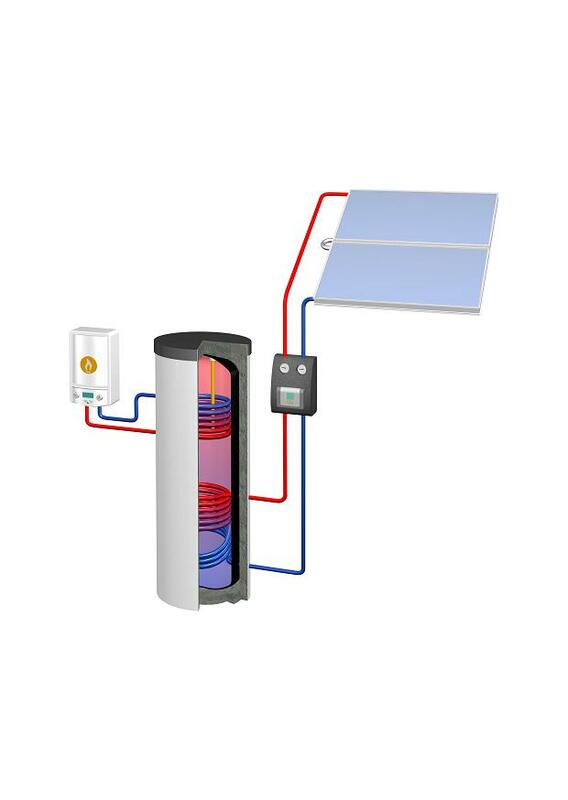 The system can be equipped with more collectors for space heating support.